Springtime in Europe and other artwork by artist G. Harvey can be viewed in our artist slideshow. Springtime in Europe by artist G. Harvey and other Gerald Harvey art, art work, artwork, canvases, giclees, images, limited editions, open editions, paintings, paper, pictures, posters, and prints can all be found at Christ-Centered Art. 3 lovely prints providing glimpses of the peaceful European countryside. 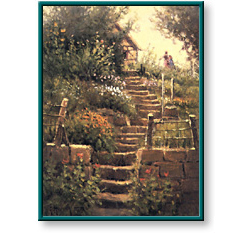 Garden Study depicts an enchanting stone staircase leading up to a hidden garden studio. Garden Walk portrays a mother and child enjoying each other's company on a stroll through the garden. Lake Chateau features an idyllic lakeside hideaway on the quiet shore of a secluded destination. This unframed limited edition paper print set comes mint in its original folio, includes a genuine certificate of authenticity from Somerset House Publishing, and is individually numbered and hand signed by the artist G. Harvey.